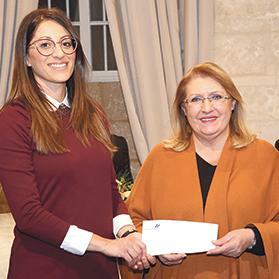 Thomas Smith Group presented the funds raised during the 20th edition of the annual Christmas Charity Swim, to the President of Malta Marie-Louise Coleiro Preca, on January 14 at San Anton Palace. The amount collected was made up of just under €7,000 from the public, while Thomas Smith topped up and rounded up the amount to €10,000. Liana Cachia, Thomas Smith marketing and human resources director, presenting the funds to President of Malta Marie-Louise Coleiro Preca. During the cheque presentation, Ms Coleiro Preca, on behalf of the Malta Community Chest Fund Foundation, thanked Thomas Smith Group once again for organising the Charity Swim on an annual basis and commended the company for contributing towards the final amount of the €10,000 donated. Ever since its inception, the group together with the swimmers’ donations have collected just over €120,000. In total, 233 swimmers of all ages braved the cold winter sea in Sliema on Sunday, December 30, 2018. Seventy-nine females and 154 male swimmers took part, with the youngest being two-year-old Sami Hagos, and the eldest swimmer being 82-year-old Wilfred Pirotta. Liana Cachia, Thomas Smith marketing and human resources director and organiser of the event, were this year accompanied by Luciano Galea (representing Thomas Smith swimmers), Jessica Micallef (representing Thomas Smith volunteers), Raniero Borg and Rainier Cachia (both representing participants). The 2018 Thomas Smith Charity Swim was supported by the Sliema local council, the Malta Police Force, the Civil Protection Department, Malta Red Cross, Emergency and Fire Rescue Unit, Għaqda Dilettanti Sajd Sliema, Vertex Vending Services, Drinks n’ More, H2Only, Deejay Arthur Garrett, WAVA, HIVE, Karl Borg Events, Transient Light & Sound, Giorgio’s, Cara’s, Clyde Dolceria, Wallace Pipe Band, Golden Gate, Resolve Consulting and many other supporters.